Decision-making can make the difference between stalling or staying stuck… or growing and reaching performance breakthroughs. As a leader you often make decisions for the business, impacting many people and at times your entire industry. Discover what is in order to make better decisions from Lori Michele Leavitt on Vimeo. … he got that and more. I’ll finish the story now: In under two years, the USS Santa Fe went from having the lowest performing team to having the highest performing team. Marquet led with curiosity, empowered the team (although he doesn’t care for the word empowerment, believing it already exists and is not something that needs to be given) and also broke down the “us vs them” mentality to build a stronger team. 2. Are you clear about your organization’s strategic direction? I work with and write mostly for leaders, those who typically have come together at least once during the year to revisit the strategic plan, including vision (the desired future state) and core values (guiding decisions and choices as you move toward the vision). Sometimes when I ask a leader what the strategic direction of their business or organization is, I’ll receive an answer that is a financial goal that can be read within a comparison of this year’s to last year’s budget, such as 20% increase in revenue this year or 10% cost reduction. Although these goals may have been set based on their vision, if revenues have been flat, for example, and there has been no discussion about how the organization or market development will change to make this revenue growth achievable, it really isn’t strategic and likely does not offer a clear strategic direction to those who must execute. Here’s another short video clip in which I talk a tough decision Satya Nadella had to make only a few months into his move to CEO. He had to be very clear about Microsoft’s (new) vision and strategic direction in order to make the best decision. Clarity & Mastery Mindsets lead to better, more nimble Decisions from Lori Michele Leavitt on Vimeo. 3. Have you considered opportunity costs? Play the movie in your head, at least! If you choose A what gets missed or delayed? Now for option B. 4. Do you understand the impact the decision will have on others, or others’ impact on the outcome of the decision? Even your best people may not do what you expect — because they are not clear about the strategic directions or objectives. Get clear and be clear. 5. What are your triggers and blind spots? These can get in the way of making decisions that truly result in taking the best next step. Consider ways – usually other people – to help you make the best decisions. We are limited in our ability to spot and address our own cognitive biases in decision making so we need other people to help us out. 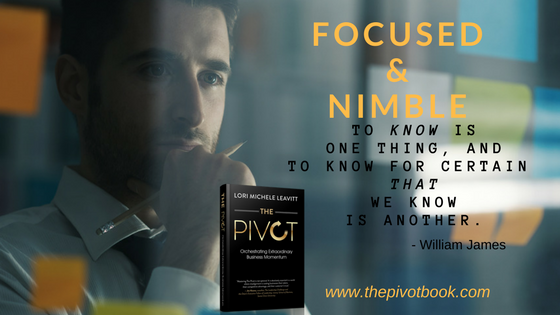 Nimble Decision-Making involves being both focused on your vision, values, strategic objectives and direction… and remaining aware and flexible to change when the landscape (people, resources, suppliers, customers, environment, etc.) changes. Only when decision-making is nimble in this way are performance breakthroughs possible. Otherwise, you may find you and your company facing a stall or staying stuck.